A little late with the update from cook that I completed on January 28. It had been about a month since the previous grill which was in late December. We decided to grill a few boneless chicken breasts and then a few turkey breasts. It would be our dinner for Sunday evening and then for two more nights later in the week. 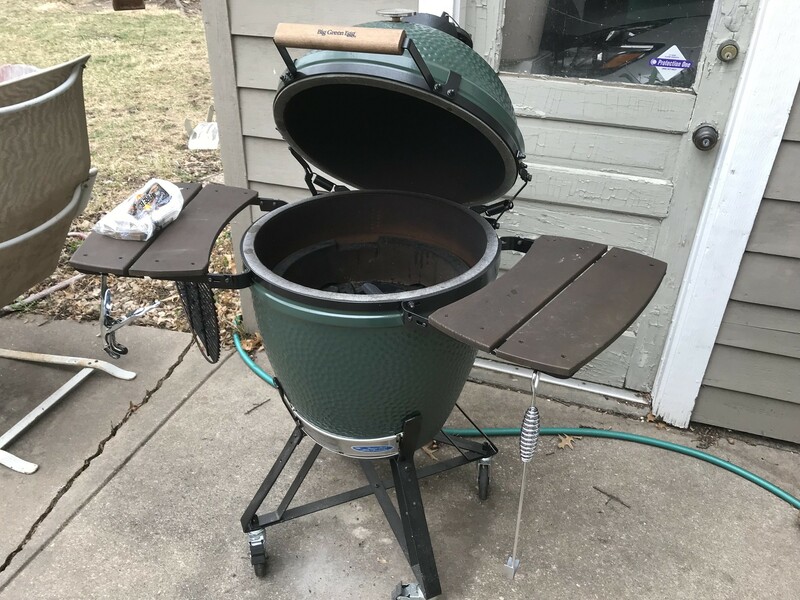 I had not cleaned the BGE since I purchased it back in August, so I decided to clean it out. When I cooked back in December, I had difficulty getting the temperature high and following that cook I accounted it to be because it needed to clean it out. Sunday, January 28 was a cold day and my hands were feeling the temperature. I managed to get all of the old lump removed from the BGE so it could be loaded and prepare for the evening cook. I only took two pictures of the cook on January 28 of the final product. I did use a new thermometer I got for Christmas. It worked great! It syncs bluetooth to my iPhone and then with my new Apple Watch, I am able to see the temperature for up two two separate cuts of meat. Easy to use and worked out great! Letting the grill get to high heat to start to cook off previous cooks, I brought the temperature back down to around 300 - 350 degrees. Keeping it around that mark throughout the cook. Turning the meet regularly, it took longer than I had anticipated for the meet to finish and reach being cooked. I was using a menu that I found on a Google search that said about eight minutes each side, but I would say it took probably closer to thirty minutes to cook both cuts of meat. I was afraid it was going to burn, but had no issues with the burn marks. The meat was extremely moist and cooked nicely. There was not any smokey flavor as the temperature was higher than what would allow the smokey flavor to get into the meat. Overall, it was a very enjoyable process and we enjoyed the meal the cooked meat provided for three additional meals. I will be cooking this evening after a snow storm came through this morning. Tonight will be a pork tenderloin and more chicken breasts, so I will once again be able to utilize the new thermometer and monitor it from inside.